Sri Lankan President Maithripala Sirisena and Chinese President Xi Jinping shake hands at a signing ceremony in the Great Hall of the People. Chinese money is buying great power in Sri Lanka, recent news reports demonstrate. Two days later, Col. Xu Jianwei, a military attaché at the Chinese Embassy in Colombo, Sri Lanka, said China would provide even more gifts: a frigate to the Sri Lankan Navy and “various training.” One Chinese expert told the South China Morning Post that China may give Sri Lanka one or two additional warships. All of these gifts come with strings attached. Sri Lanka is located along China’s cherished route of ports, sea-lanes, highways and railroads known as the “String of Pearls.” Its strategic location in the Indian Ocean, some 30 miles south of India’s southwestern coastline, makes it crucial for Chinese trade and projection of its power abroad. 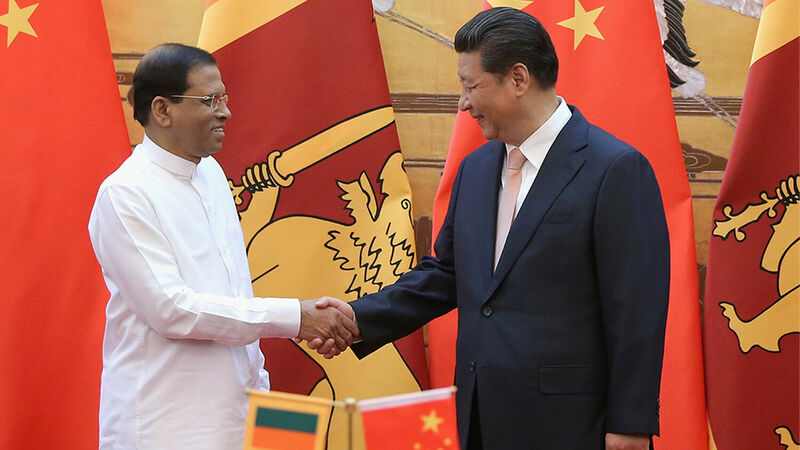 “Over the last few years, Sri Lanka has become a case study of how Chinese money and clout have the capability to buy favors and concessions,” wrote the Asia Times. China’s opening came in the late 2000s during the Sri Lankan civil war. The Chinese provided assistance to the Sri Lankan government during its campaign against rebels known as Tamil Tigers. The result was a “major expansion of Chinese investments and influence in the country,” according to Jeff Smith, a research fellow at the Heritage Foundation. “Sri Lankan officials are quick to point out that the [Hambantota lease] agreement explicitly rules out China’s military use of the site,” wrote the Times. “But others also note that Sri Lanka’s government, still heavily indebted to China, could be pressured to allow it.” After all, China once ruled out militarizing its islands in the South China Sea. But now, it is militarizing them quite openly. When you look at the “String of Pearls” with its empty ports, quiet airports and lonely highways, you could think China had made poor investments with little opportunity for return. But these are part of a developing Chinese superhighway. Nations like India and Japan are finally waking up to the realization that Chinese-controlled ports don’t just take in tankers. They take in warships. Airstrips don’t just accommodate cargo planes; they also provide landing areas for fighter jets. China is gobbling up parts of the South China Sea, the Indian Ocean and elsewhere. China is using its economic power now to secure major global trade routes and to increase its options for naval bases in the future. Red China insists it has a legal right not only to Tibet but [also] to many parts of India and Southeast Asia. … Their constant dream for centuries has been ultimate world conquest! … China knows, however, that in this highly industrialized age she can accomplish this dream only as an ally of Russia. … China is now ready to begin devouring the rest of Asia with Russia’s secret military backing. The Bible forecasts the rise of a powerful alliance, known as the “kings of the east.” It is these prophecies that prompted the Plain Truth to give this warning so many years before China became a major power. The Bible makes clear that this military alliance will be able to project great power around the world. To learn more about it, read our free booklet Russia and China in Prophecy.